These Modular Drainage Tiles Easily Snap Together To Create Drainage Systems That Fits Your Workspace. Large drainage openings, rugged plastic and an anti-slip texture make these drainage systems used for industrial use such as greasy food service environments. 12" sq. tiles. Safety Grit Top Drainage Tiles provide added traction in wet or oily areas with rugged carbide grit texture. 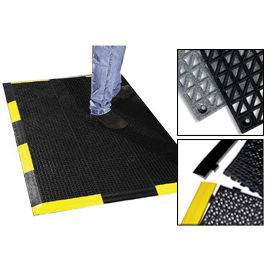 Optional Ramps and Corners provide a beveled edge in black or high visibility yellow. Tiles sold in cases of 36.